Hey, we have a new SUV or wagon or truck purchase coming up for my family. We used to own a Jetta Sportwagen (automatic version) and are now seeking to head back to a manual transmission vehicle. We love manual transmission driving and feel like it's a now or never again purchase. We will buy low to mid-mileage used and are open to models between 10k - 20k. We're four people (wife, me + 7 year old + newborn) and we live in Santa Fe, are outdoors and camp alot, and want something we can take to the mountians regularly. 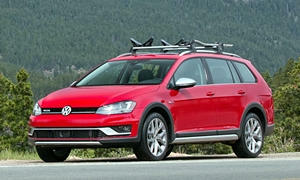 I know the Alltrack is supposed to be a slam dunk here, but man the Sportwagen was kinda boring and dissatisfying for my tastes and was a little fishtaily in snow and ice. The CX-5 and Outlander aren't available with AWD and a manual. Only FWD and a manual on the base trims. I wouldn't consider a Mitusbishi because they have not made a competitive car for a very long time. Their current lineup is still lackluster. The CX-5 is the best option I'd say. It is fun to drive, efficient, and reliable. I would test drive it to see if it is powerful enough. The previous generation had the underpowered 2.0L on the base trim with a manual. They make one of the best traditional non-DCT automatics, but it ain't a manual. Road noise and the stiff ride are the only complaints I would note from 2013-2016. 2016 had a better infotainment system and some other upgrades. 2017 was a major redesign without a manual. The 2.0L engine is good for the small Mazda3, but not as much in an SUV. The manual is definitely the better choice to use all 155 hp. 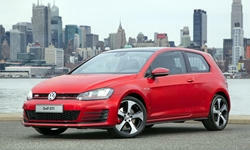 The best "automatic" transmission is probably the VW DSG found in the Alltrack and many other VW products. It requires maintenance every 40k miles or so, but I think it is worth it. The manual is available with the S and SE trims. I would just worry about long term reliability with the Alltrack because VWs usually need some expensive repairs when they age. 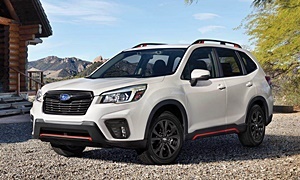 It is the only SUV/wagon I could find that has a manual and AWD except the Subaru Forester.The Subaru is a good choice, but less engaging and Subaru isn't an option for you. If you want something not mentioned, the Honda HR-V is worth the look. It is more efficient and smaller than the CX-5 and Alltrack, but the trunk is much larger and more useful than the numbers suggest. This is the major selling point of the car. The LX and EX trims have a manual. The manual has longer throws I've heard and is not one of Honda's best manuals. Reliability will be up there with the Mazda or maybe better. Alltrack and CX-5 are my top choices. Please tell us what you buy in the end. Good luck! Thanks so much for taking the time to answer this. Helpful. Affirming. 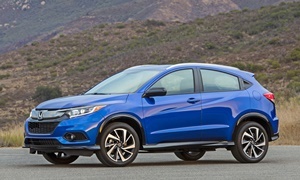 I say this because both the Alltrack and CX-5 are top safety picks and the HR-V is not (IIHS). Indeed, once we find the ride, I'll share! As you mention, the two crash testing services are different. 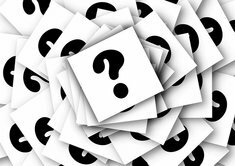 Most manufactuers put their money into meeting the government regulations - or NHSTA. It is also where the recalls come from. Doing well in that crash test is like the "seal of approval" from the federal govenment as they are constantly making that test harder - and then IIHS follows sometimes (or not). The insurance one is done so the insurance companies set their rates on the cars based off of those instrumented tests. The manufactuers like to do well here as well but note the priority for them is to do well on NHSTA (and not fall down on IIHS in the process). May not be the answer you are looking for, but it is the reality behind both those tests. Cars tend to sit similar in both tests, but you are right - some don't test the same. Also, you cannot compare the American results to other continents - the safety tests in America are harder and more extensive than anywhere else except Sweden (the one exception). I am not commenting on what Lectofuel wrote because I agree with it. You took out the cars with manual and AWD with your exclusion list - manual is going away across the board in any case (Subaru is with its redesigns dumping it as well now). The new Mitsubishi Eclipse Cross is testing better for the first time in years for Mitsubishi but like Lectrofuel says, probably better to avoid as it is brand new and who knows what the quality will be. Wow. This is incredibly helpful. Thanks AcuraT. In what way was the JSW boring? If you mean boring to drive, it's going to be hard to find a more fun-to-drive crossover for $17k. In my experience the CX-5 is only fun relative to direct competitors. 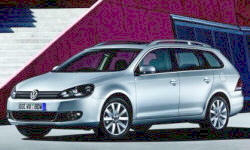 The current Golf SportWagon does drive considerably better than the JSW. I compared it to the CX-5 here. I'd drive one before ruling it out. A manual-trans Subaru Forester might work, if you can find one. It's a different, truckier sort of driving experience than in the VW or the Mazda. For fun-to-drive the current Mini Clubman comes to mind, but it likely won't have enough cargo capacity. The latest Minis have been reliable so far based on a small amount of data, but they're still young. Will they remain reliable as they age? Hard to say. Possibly worth a look. I'm shocked about the HR-V's safety scores. They really aren't that good. It is still a safe car, but not as strong as the newly designed cars or even the previous CX-5. Perhaps because it is based on the Honda Fit, which is a smaller less substantial car. The Forester would seem like a slam dunk in your situation since you prefer AWD and manual. Thanks Michael. Indeed, I had a 2012 JSW S. I think that it had bad mojo. Plus the ground clearance was a problem. Plus, I was coming off a manual Volvo S40 that I loved. At times, I've thought of going for a higher mileage, 2011 XC60, understanding it's not a manual, but then those $500 visits to the garage just don't appeal when hub bearings and the emissions systems begin failing. I will drive the Alltrack and see, for sure. 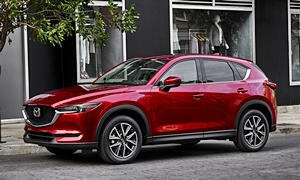 The CX5 -- feeling hesitance, but I'll drive it. Fun in context I get. Plus, it's not as family friendly as the Alltrack just in terms of room. Wow, the Clubman. I'll check them out too. LectroFuel, re: HR-V, I know, right? I was pretty surprised, too! I test drove a 2008 Forester awhile ago and really disliked the road noise and handling, but I'll consider it in the mix. I know, the Subarus seem a slam dunk, I just have never been aesthetically drawn to them. The Forester and most other Subarus prioritize substance over style. They are much better than they were a decade ago. The Forester won't give you a sporty driving experience, but a comfortable one. Michael was correct when he said it feels more like a truck than the Alltrack or CX-5. I would not consider the Mini if I were you. It is a budget BMW (BMW owns Mini), which means you'll be paying a lot for repairs once the warranty ends. Even if the TrueDelta scores are decent for the car. It does what you are looking for though, just not reliability. I've heard a lot of horror stories and it is logical to assume it will be as reliable as BMWs are. BMW has the highest repair costs of any brand. 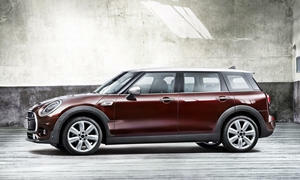 If the JSW didn't have enough ground clearance, then the Clubman certainly won't. The Countryman might have enough, but the current gen is probably then too new to fit within your budget. The previous generation Countryman was smaller and has proven unreliability. Even the current one is likely too small for your needs. I'm sensing that you're going to do all of this and end up with another VW. Just to put a positive word in for the much maligned Mitsubishi... Our 2011 Outlander Sport SE AWC has been problem free since new, now at 130k miles. No major repairs, a couple of minor recalls (wiper motors). Coming from an older (ahem, 1996) Subaru Impreza Outback Sport we gained technology (keyless entry, push button start), passenger space, cargo space, ground clearance, a little better mpg's, 2wd for road and two AWD modes. With the rear cargo space and a rack/box on top we've managed to pack quite a lot in this thing. I can confirm it's big enough to fit 3 adults and one dorm room full of stuff, and bags for 2 hotel nights. Sure, cheap(ish) interior, a bit road noisy, and only CVT transmission on the AWD model (but with 6-speed paddles for fun). I would have loved the same vehicle with a manual transmission. If you take a little care it's not so hard to keep even a cheap interior clean and functional for years. It's been easy to maintain, oil, filters, plugs, brakes, rotors, etc. It actually feels a little old-school-ish somehow, simple and straight forward. AWD has been good and capable in winter (northern Illinois), and for all our non-paved driving mostly on forest service roads and the like in NW and UP Michigan. All in all we've been pleasantly surprised after choosing the Outlander Sport over the larger Outlander and Forester (in 2011). Just some food for thought. 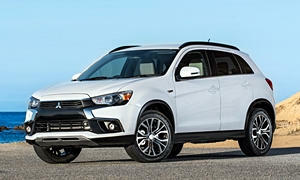 *Also note that you could buy a brand new Outlander Sport with AWD for around $17,000 these days. Janthenat, thanks for your perspective on the Outlander and the Golf. We'll definitely test an Outlander......with an open mind! Finally settled on a vehicle...we went for a re-released 2011 Jetta Sportwagen TDi with a 6-speed manual and 53k miles.. Michael was right! Night and day from the 2012 S we owned. Love it. We're going to get it lifted for tougher terrain. Thanks for all the perspective! Thanks for giving us an update! I think you made a good decision. Maybe consider buying a set of smaller wheels and tires with a thicker sidewall for the tough terrain. Usually, the TDI wagons have lower-profile tires that can't take much of an impact. Best of luck with your purchase, thanks for sharing! Be careful lifting a vehicle. There are a lot of issues that can be caused by a lift. Scotty Kilmer, who is a mechanic with ove 50 years of experience, now shares it on YouTube (he also used to share on CBS in Texas). He is really knowledgeable and gives the risks of a lift. You may want to see this just to be aware of the risks associated with a lifted vehicle. I will definitely follow the wheel/tire advice, Lectrofuel! I thnk that is a great idea indigobluish. A panzer skid plate won't mess with all the other things that Scotty Kilmer points out that can go wrong with a lift. Wishing you the best with your purchase (and the great idea of a skid plate)!